– Click ‘SHOP’ in the top horizontal bar and click on your preferred style. – Here you will see more information and larger images, as well as alternative colour and style options. – Once you have found an item, click on the ‘ADD TO SHOPPING BAG’ button. – Review and edit item quantities in your shopping bag by clicking the ‘SHOPPING BAG’ link at the top of the page. – Click on ‘CHECK OUT’ to complete your order. You will then be taken through the checkout process where you can edit or confirm your order, create or log-in to your account, enter your delivery and payment details and confirm your purchase. Yes, you can order over the phone. Please call +353 87 6417599 between 10am and 6pm (GMT), Monday to Friday and Customer Care will be delighted to assist you with your purchase. Yes, we offer a free gift-wrapping service at checkout. If selected, we will add a knotted CIARA SILKE ribbon to the packaging, as well as an optional personalised note. When you complete the checkout process you will be presented with an order confirmation page and you will be able to click through to print your order details. In addition, you will receive an email confirming your order details and that the order has been received. WHAT HAPPENS IF MY PACKAGE HASN'T ARRIVED? Our delivery time starts from the moment payment for your order is processed and a further 24 hour period where your items will be dispatched by our warehouse during weekdays. Please note that this can take longer during our busy sale periods and national holidays, when it may take up to 48 hours for shipments to be dispatched. Orders placed over the weekend will be dispatched on the next working day. The expected time for delivery may vary depending on the delivery destination. If you have not received your delivery after the expected delivery date, please call Customer Care on +353 87 6417599 between 10am and 6pm (GMT), Monday – Friday or email ciara@ciarasilke.com and we will track your order for you. Making a return or exchange is easy. You have 14 days from our dispatch date to decide whether to keep your items. Please include your original receipt in the returned parcel and a print out of your returns authorisation email. Any returned items that are not accompanied by the official documentation will not be accepted. Please note that, currently, postal costs for returned goods are the customer’s responsibility. If you wish to receive a refund we will re-credit the original purchaser’s credit card for the sum paid less any taxes and duties and less the postal costs. Customs duties and sales taxes are non-refundable. You may be able to recover customs duties and sales taxes by contacting your local customs bureau directly. We can cancel or exchange an item or edit your billing and shipping details before your purchases have been prepared for dispatch. WHAT IS YOUR POLICY ON RETURNING DAMAGED, FAULTY OR INCORRECT PRODUCTS OR GIFTS? If you take delivery of a package from us and the contents have been damaged in transit, or the item is faulty we will exchange the damaged or faulty items without charge to you provided you return the item(s) to us within 14 days of taking delivery. If we have sent you an incorrect item, please notify us via email at ciara@ciarasilke.comas soon as possible and return the incorrect item to us and specify the correct details in writing. If you would like us to replace the incorrect item with the item you ordered we will send you the correct item as soon as possible. We will not charge you for the incorrect item and will reimburse your costs in returning it. If you have received an item from CIARA SILKE as a gift you may return it for an exchange or gift card to the same value of the item(s). You can buy a CIARA SILKE gift card in Euro by visiting our Gift Cards page. – The gift will be delivered in CIARA SILKE signature packaging and is subject to shipping charges. For further assistance placing an order for a CIARA SILKE gift card please contact Customer Care by emailing ciara@ciarasilke.com or call +353 87 6417599 between 10am and 6pm (GMT), Monday – Friday. WHAT IF THE PRODUCT I WANT TO BUY IS OUT OF STOCK? All items are in stock unless “THIS ITEM IS OUT OF STOCK” is displayed. Please be aware that even if an item is in your shopping bag, it can still be bought by another customer until you have completed your order. For information on delivery and shipping charges to your destination, view our Shipping and Tax information. WHICH COUNTRIES DOES CIARA SILKE SHIP TO? CIARA SILKE ships to all countries worldwide. DOES CIARA SILKE SHIP TO MULTIPLE ADDRESSES? In order to ensure a secure shopping environment, we use secure socket layer (SSL) technology. This encrypts and protects the data sent by you over the Internet. Where SSL is enabled you will see a padlock icon appear in your browser that you can click on to find out information about the SSL digital certificate registration. Please be assured that we take data protection seriously. Any information that you provide to us will be stored and processed in accordance with the Data Protection Act 1998. We will hold and transmit your information in a safe, confidential and secure environment. If you wish to be removed from our mailing list you can click the ‘UNSUBSCRIBE’ button on any of our email newsletters. Alternatively, please email us at ciara@ciarasilke.com with all your contact details and mark the email subject, “Unsubscribe”. Please note this process may take up to 28 days. WHAT PAYMENT METHODS DOES CIARA SILKE ACCEPT? Payment can be made securely online by Visa, MasterCard, American Express and Maestro cards through Paypal. The credit/ debit card that is being used must be yours. All credit/debit cardholders are subject to validation checks and authorization by the card issuer. If the issuer of your payment card refuses to authorize payment, we will not be liable for any delay or non-delivery of your order. We also reserve the right to cancel your order. We may request that shipping be to the credit card billing address only. By submitting an order to us through our website you represent and warrant that the payment details provided on your order are valid and correct and that when your order is accepted and processed by us, payment will be made in full. If the billing details for your order are the same as your delivery address details, by placing an order on the website you confirm that you are the person referred to in the delivery address details. Otherwise, by placing an order, you confirm that you are the person referred to in the billing details. If you would prefer to place your order by telephone, you can call Customer Care on +353 87 6417599 between 10am and 6pm (GMT), Monday to Friday and we can assist you with your purchase. WHEN DO YOU CHARGE MY CREDIT CARD FOR PAYMENT? Your card will be charged immediately before order confirmation email. HOW ARE DUTIES AND VALUE ADDED TAXES (VAT) CALCULATED? During the buying procedure, you will identify the destination country for the items. This information is used to then re-calculate the Irish VAT duties for the destination country. These are calculated and shown to you as part of the final invoice before you authorize payment. Please refer to individual product pages for the item’s sizing shown in centimetres and inches. HOW DO I CARE FOR My CIARA SILKE scarf? 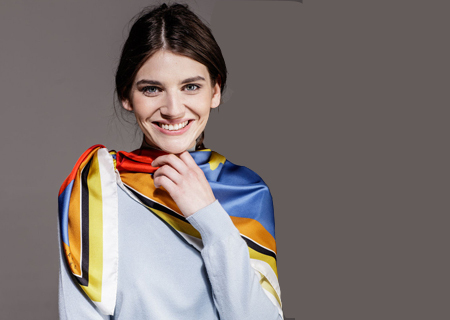 We recommend that you avoid washing your CIARA SILKE scarves and instead entrust them to your dry cleaner, who will clean them professionally and pay careful attention to their hand-rolled hems and hand-finished details. Do not machine wash or bleach any CIARA SILKE scarves. Always iron on a cool setting, making sure to iron on the reverse of printed styles. Always avoid ironing hand-rolled hems and any embroidered, surface detail. Please remember that printed silk can be damaged by rain. WHERE ARE CIARA SILKE PRODUCTS MADE? Each CIARA SILKE printed scarf is made by hand in historic mills in Como, Italy, the home of world-class, luxury silk printing. The scarves are impeccably finished with hand-frayed or hand-rolled hems; every hand-rolled hem takes up to an hour of meticulous craftsmanship from an expert seamstress. WHICH FABRICS DOES CIARA SILKE USE? We use the finest, natural fibers and luxurious blends for every CIARA SILKE scarf. Our fabrics have been extensively tested to ensure the softest and most sumptuous handle, as well as the most vibrant, long-wearing colour. Please contact ciara@ciarasilke.com if you would like more information on carrying the CIARA SILKE collections. WHAT IF I'M UNHAPPY WITH THE SERVICE I'VE RECEIVED? We make every effort to ensure you receive the best possible service when using the CIARA SILKE online boutique. If however you are not entirely satisfied with any aspect then please contact Customer Care on ciara@ciarasilke.com and we will happily answer any queries you may have. Hopefully you will find all your questions answered here, if not please send us an enquiry and we will happily answer any queries you may have.